You can read everything about HelpScribble's features and benefits. You can find out what the people say about HelpScribble. 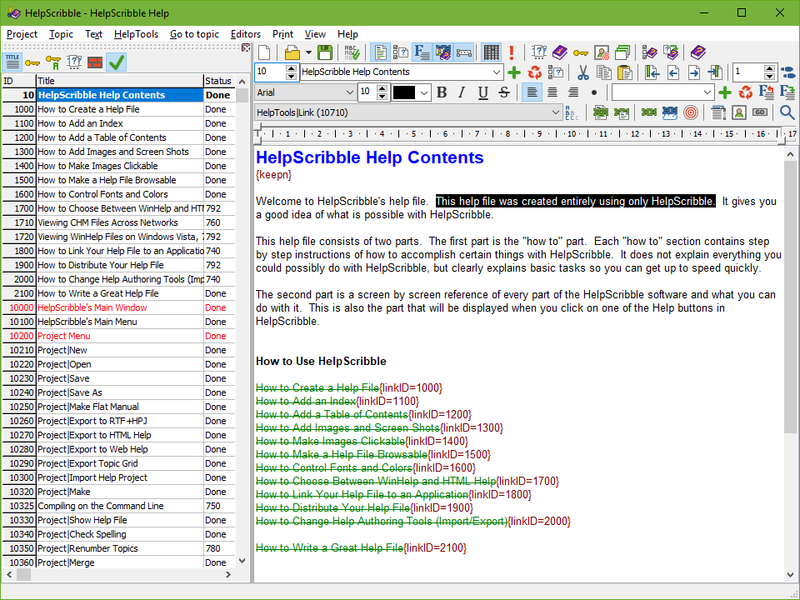 You can download the free evaluation version and check out HelpScribble first hand. Or you can simply buy HelpScribble for US$ 99 and try the full software risk-free for three months. "I would like to say thanks for HelpScribble. It is idiosyncratic in one or two minor aspects, which is something I like actually, but it is so easy to use and makes the job of writing help files a pleasure. I followed the guidance given in your own "How to write a great help file" topic, and a reviewer of my product had this to say: "I think the help is some of the best written user assistance material I have seen for software of any kind - clear, informative and thorough". I'm happy to share the credit for that with HelpScribble." "Great Product!! It makes doing my help files a breeze. The helpfile is the hardest part of my projects that I have to do. It is cumbersome and equates to doing paperwork. But, HelpScribble got me past this issue. It was by far the best investment I could have made. "p.s. – all of the other products are just as great, especially Deploymaster. Just Great Software, the name says it all." "Your Help Scribble product is awesome. I downloaded the demo version and was able to complete in one week a help file project I have been putting off for a year. Your online demos are spot on. Its rare to find a software product that works as easily and as well as the author claims it will. I only hope my software package, the one I needed the help file for, works as well as yours. Thanks again for a great product."